32Red’s betting expert Jack Milner takes a look at this weekend’s Bolton v PNE derby plus the Premier League programme and next week’s Champions League. I had the pleasure, or perhaps the misfortune, of braving the conditions last Friday for a disappointing stalemate in freezing conditions at Deepdale as Preston and Derby played out a goalless draw in front of the Sky cameras. PNE are a very well backed 5/6 to claim bragging rights, Bolton 7/2 underdogs on home soil and the draw 13/5. 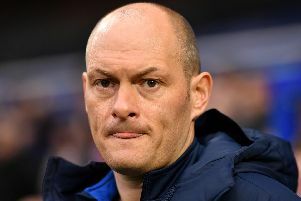 North End boss Alex Neil was very pleased with his side’s organisation at the back against Derby County last weekend, and a replication of that defensive prowess should have them beat a Bolton side as short as 1/8 with 32Red to be relegated at the end of the season. PNE are 15/8 with 32Red to win to nil, and an even bigger 9/4 to score in the double-result market. We have flip-flopping favourites in the race for the Premier League Title w ith Manchester City leap-frogging Liverpool as the new 10/11 favourites with 32Red to be crowned champions in May. Jurgen Klopp’s side did column readers a massive favour Monday night in the capital, drawing 1-1 at The London Stadium as West Ham battled bravely to earn a deserved point in front of a sell-out crowd. Michael Antonio’s first-half equaliser was good enough to hold the visitors, meaning column readers who backed last week’s Bet of the Week (West Ham Double/Chance at 10/3 with 32Red) collected for a second week in succession. Here’s hoping plenty out there got on accordingly! Those two dropped points saw Liverpool relinquish top spot in the table for the first time in months, albeit on goal difference. However they do have a game in hand on Pep Guardiola’s side and are, perhaps, over-priced at 13/10 to win a first league title in 29 years. The Reds should reclaim top spot, for 24 hours at the very least, and are 1/5 favourites to beat Bournemouth at Anfield on Saturday; the visitors 14/1 to cause an upset and 6/1 to take a point back to the south coast. Premier League Title prices from 32Red: Man City	8/11; Liverpool 13/10; Spurs 20/1; 250/1 Bar. Prior to that, Manchester United travel to Craven Cottage bidding to continue their 100% record away from home under interim boss Ole Gunnar Solskjaer in a huge week for both the Norwegian, and indeed the club. United host PSG in the first leg of their Champions League clash midweek, with an injury-hit PSG side at Old Trafford midweek. United are a great price to claim three points in West London; capitalise on 32Red going top price on The Red Devils at 7/10; the hosts 5/1 and the draw 3s. Providing the Red Devils come through their trip to West London unscathed, then they are likely to be chomping at the bit to face the French champions in the new boss’ first taste of Champions League action in the dugout. United are 6/4 to win in midweek, 7/4 to qualify for the quarter-finals and 33/1 to conquer Europe. Their ‘noisy neighbours’ remain favourites for that accolade, and with a two-legged affair Shalke starting with a trip to Germany in 11 days’ time. The Citizens are 7/2 with 32Red to complete a maiden Champions League success this summer and are, as short as it sounds, 1/20 to advance to the quarter-finals at the expense of their German counterparts. After a turbulent last month or so, City have burst back into life and should lay down a marker for the final third of the season when hosting Chelsea at The Etihad on Sunday; the hosts 1/2 favourites with 32Red, The Blues 11/2 and the draw 3s. Maurizio Sarri continues to bemoan his squad in the media, and with rumours linking talisman Eden Hazard with a move to Realy Madrid all is not well in West London. Despite beating Sheffield Wednesday and Huddersfield on home soil at Stamford Bridge, they have struggled on their travels, losing their last two league games 2-0 and 4-0 at Arsenal and Bournemouth respectively. I expect them to struggle against Guardiola’s formidable forward line and think they represent terrific value at 7/2 with 32Red to win by three or more goals on Sunday.